January 18th, 2019 - SEND ME A KEYCHAIN!!! Anywhoo, if you check my sticky post, Abby the Venus Guy Trap contacted me last month. 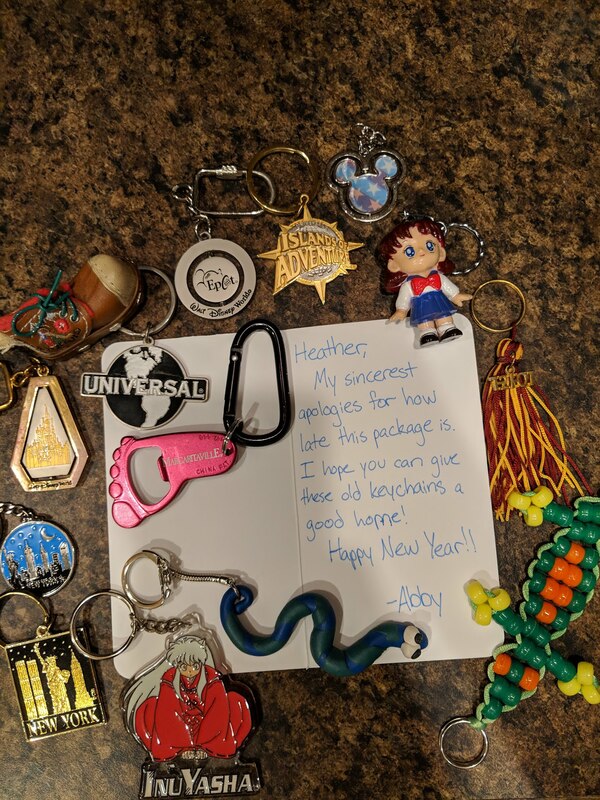 There is no need to apologize for sending the keychains later than anticipated, Abby, because between travel and catching like three infections in a row, I have been doing everything very slowly in life myself as well. The keychains are safely here and already well loved and that is what counts! I suppose we should start with the cool handmade lizard keychain and move clockwise. I absolutely love these handmade lizards and can never have enough of them since they are always slightly different. Lizards really are the best. I'm also a fan of the clay worm/snake with HUGE EYES. Gosh, what a cutie! I had to give InuYasha a google but the manga does sound fun. Demon dogs? Feudal Japan? Fairy tales? Sign me up! I also really like these New York keychains as well. New York is one of those keychain locations where lots of keychains look the same but they are usually all different! I don't have any that look quite like these so thank you again! Skirting back a little, I really like that Swiss hiking boot. I was in Zurich's airport a few months back but wasn't able to grab a keychain and make my connection so I'm glad to have this little boot. The Alps from there air are always so lovely! I'm not sure who that girl in the school looking uniform is supposed to be in the top right corner but she is pretty neat as well. I love a good bow tie. The tassle is also a really great find because it is garnet and gold which as well all know are THE superior colors for a school. GO SEMINOLES! Thanks again, Abby, for taking the time to donate these to my collection. I am super grateful and I already enjoy them so much!